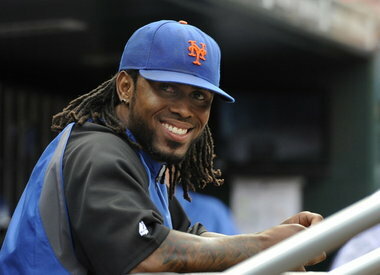 Jose Reyes watches from the dugout after pulling himself from the Reds game. Jose Reyes blew it. He should have followed in the great Ted Williams footsteps . Met fans don’t really get much to cheer about unless its every 15-20 years. The last big thing we had was 1986. Yesterday could have been a shiny moment, although not grand, but still something to cheer about after another horrible season. Jose Reyes won the National league batting crown which for those of you not in the know, means he hit for a higher batting average than anyone else in his league. Not an easy thing to do and especially if you are a NY Met. There has never been a NY Met to win the National league crown. I believe the last Met to get close was Cleon Jones in 1969. Sounds like a pretty good accomplishment for a Met but indeed it did not come without controversy. Jose Reyes chose to take himself out of the game after getting a bunt single in the first inning, so as to preserve his lead in the standings and make it very difficult for the next closest hitter to catch him. Ryan Braun of the Milwaukee Brewers was that hitter. He needed to go 3-4 in his final game to overtake Reyes. Knowing that , Reyes chose not to chance taking extra at bats. Bush league as some might say. Ted Williams, when faced with the possibility of hitting .400 chose to play in both games of a double header instead of sitting out and letting his average remain at .400. That is what Reyes should have done. Earn it. Make it right and don’t cop out. Real accomplishments should be earned if they are to mean anything. Too bad for Braun, that he really never had a fair chance to go up against Reyes for at least four at bats. Being a Met fan it only makes me feel worse. It seems that even our best players rarely do the right thing. I guess it really isn’t so bad after if I compare it to the self destruction of two of our best ballplayers, Dwight Gooden and Darryl Strawberry, back in the 80’s. Those two guys really killed Met fans. Sometimes its not what you accomplish in life, but it’s the character you show in trying, that really makes people admire you…..